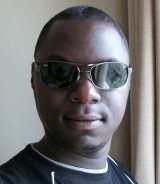 My name is John Paul Chacha, I'm a self-taught programmer from Kenya. I started coding as a hobby when I was fifteen. I prefer coding in C and C++ with a bit of inline Assembly here and there. I'm also familiar with a few other languages like Delphy/Pascal and VB, but I rarely use them. For web design, my preferred language is PHP. I believe software should be fast, reliable and efficient, and I try my best to make sure that all my code conforms to these ideals. I believe bloatware is bad for the future of computing, and I therefore strive to keep all my software simple, fast and clean. I also believe in trying new methods and ideas, and that “established” methods are not always the best methods. Yes, I'm Kenyan to the bone - yes, the East-African country that wins all the gold medals in the long-distance Olympic races. The Kenya of the Great Wildebeest Migration, the Kenya of the Lions of Tsavo, the Kenya where “Hakuna Matata”. Yes, that Kenya. Do you live in a tree? No, the Discovery Channel people exaggerate a bit - we have sky-scrappers and jet-liners, too. I live in Nairobi, the capital city of Kenya - most of the time, at least. I love traveling. We call it “domestic tourism”. Because I'm still a “small name” in the software industry, but I'm hoping you are willing to assist. So, if you like my software, tell everyone you meet about it.